You must be familiar with fog, right? 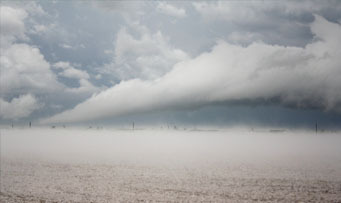 In this article, let us consider one type of fog that emerges after a hail – the hail fog clouds. Find out some interesting facts about this particular cloud formation. Hail fog clouds are thin layers of clouds that form in the area of intense hail accumulation. In other words, these clouds make up the fog that develops due to hail. The hail fog cloud forms soon after hail falls onto the ground and cools down the warm, humid air on top of it. Hail fog is often localized but can be so thick and abrupt that it causes reduced visibility and poses danger to the roadways where the hail fell. At What Height is Hail Fog Clouds Found? The fog is one of the ground-hugging clouds, which means, it is in contact with the ground. Since hail fog cloud is one type of fog, it is found at the ground level. This cloud formation is largely composed of water droplets which are sufficiently light that they remain floating in the air. Generally, fog is referred to as low-lying stratus clouds since like the latter, the former is a steady deck of clouds that take shape when an even, cool mass of air is trapped under a warmer air mass. How is Hail Fog Cloud Formed? When cold hailstones fall on the ground after an extreme thunderstorm, it cools the air near the ground thus forming hail fog clouds. This starts when water evaporates and becomes water vapor. As the water vapor rises, it combines with small air particles or condensation nuclei forming water droplets. When the water droplets condense near the ground, it forms the fog. However, full development of fog only occurs when the temperature of dew point and air is less than 2.5 degrees Celsius and the relative humidity is almost 100%, where the air is more saturated and capable of holding more water vapor. What do Hail Fog Clouds Look Like? Hail Fog clouds are very much similar to the clouds you see up in the sky, but this time, only on the ground. They are like grey mist which makes it difficult to see the areas they cover. How common are Hail Fog Clouds? Since this cloud type forms after a hail, then, it is common in areas where hail storms strike. In the United States, some of the regions frequently assaulted by hail include Amarillo, Wichita Falls and Fort Worth in Texas; Tulsa and Oklahoma City in Oklahoma; Dodge City and Wichita in Kansas; Denver and Colorado Springs in Colorado; and Kansas City in Missouri. Oftentimes, hail is associated with severe thunderstorms and tornadoes. So, if you live in the region called “Tornado Alley”, you may normally encounter hail fog clouds as well. Hail fog clouds, just like other types of fog, render an atmosphere of mystery. This kind of somber ambiance may appeal to some, but these clouds do pose hazard on the roadway due to reduced visibility. So be prepared and be careful after a hail as hail fog clouds may appear abruptly.